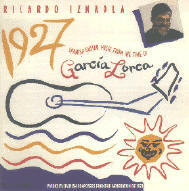 he exciting music in this CD was written by composers who were contemporaries of the great Spanish poet Federico García Lorca, whose centennial was celebrated in 1998. This is an indispensable addition to the record collections of those that admired Mr. Iznaola's pioneering world-premiere recording of the Sonata by Antonio José, another member of this generation of Spanish Artists known as Generation of 1927. Note: This is a pure acoustic digital recording. No signal processing or reverberation has been used.